Is the Sony FS7 the best run-and-gun camera under 10 grand? Sony’s XDCAM series of cameras have long dominated in a variety of fields, from documentary shooting to reality television capture. Their high image quality and accessible price points made them wildly popular, and a staple of many professional shoots, to the point where most shooters can spot an EX-1 or EX-3 at a thousand paces. As time has gone on, the XDCAM lineup has grown to include such standouts as the stunning HD-capable PXW-X180, but Sony has expanded beyond their standby form factor to add some cameras with a slightly different flavor. A true standout in this regard is the Sony PXW-FS7, a Super 35 sensor-sporting camera built to adapt to nearly any shooting environment. In fact, one might argue that the FS7 is the most versatile camcorder in it’s price range. What makes the FS7 such a handy shooter? Well, to start, it’s modular to an astonishing degree. Imagine assembling a rifle at the range, except that the rifle has one core component, and as long as a lens gets added to the mix, the device is going to work just fine. Add another component and it can be used in different ways. The components include, most importantly, a shoulder-mount friendly arm with shooting controls. This sculpted, telescoping hand grip includes zoom, start/stop and assign controls and is adjustable enough to make the camera extremely comfortable on a shoulder. Sony has also included a proper viewfinder, complete with a detachable viewfinder extension box, as well as a 15mm rod mount. It’s like they took a brilliant core camera, looked at the top 3 accessories pros would have to go out and purchase to adapt an FS7 for their use, and they simply included them or offered them reasonably. When was the last time a major camera manufacturer threw in accessories? Now being a pro camera doesn’t mean that the FS7 uses parts and accessories that are only for the rich and famous. 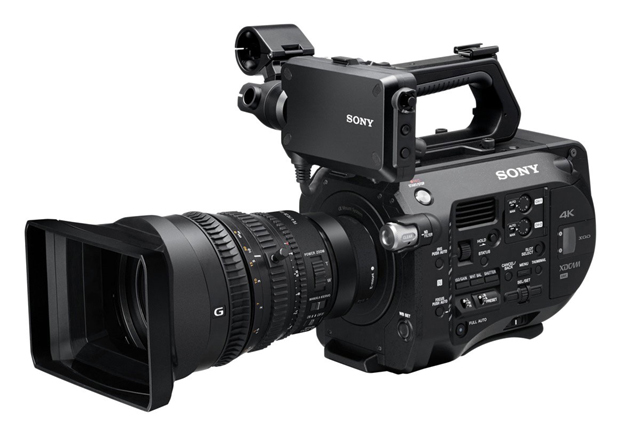 The FS7 uses Sony’s popular E-Mount system, and will take advantage of Sony’s extensive lineup of compatible lenses. Most often spotted on the FS7 is Sony’s new 28-135mm F4 Cine servo zoom lens. This lens has true manual control over focus, iris and zoom and zoom is controllable via servo from the FS7 hand grip. For those invested in glass from another manufacturer, inexpensive third party adapters will help mount lenses that aren’t compatible. Ok, so here’s where we get serious. Does the FS7 have the image chops to vie for the title of best run and gun camcorder ever? The PXW-FS7 utilizes Sony’s XAVC-L recording system, boasting incredible 10-bit 4:2:2 recording, while keeping the workflow affordable by keeping things at a budget-friendly 50 Mbps. If HD isn’t going to cut it, other options include on-board 4K (3,840 x 2,160), 113 Mbps XAVC-I recording (borrowed from big brother, the WAY more expensive F55), MPEG HD 422, Apple’s ProRes codec, and even an option for outboard RAW recording. There is an extension unit and outboard recorder available now for RAW recording, sold separately, and there is one on the way for ProRes recording. All of this heavy duty capture is handled with XQD cards capable of up to 600 Mbps. For all of this pro goodness, Sony has priced the FS7 very reasonably at $7,999, with that big ol' 28-135 Cine lens coming in at just shy of $2,500. Tech Magazine: Is the Sony FS7 the best run-and-gun camera under 10 grand?